A 1912 Craftsman house located in Laurelhurst, Portland, OR. This is the restored living room. 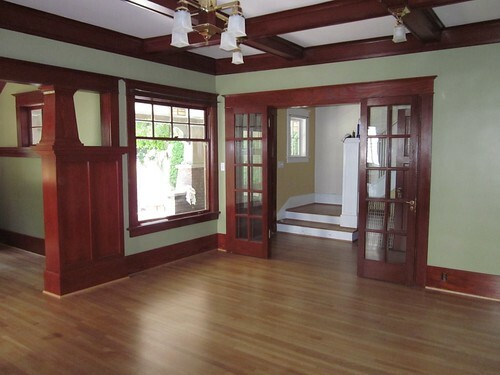 All of the white paint was scraped off the existing douglas fir woodwork, then the woodwork was stained and shellacked. The plaster was repaired and painted in proper Craftsman colors. The light fixtures were replaced on the box beams (we found wires inside them during the paint stripping process). And all the lights are new reproductions to replace an inexpensive Home Depot fluorescent flush mount light.